This past weekend, around 50 high school seniors arrived on campus for EXPLORE Bowdoin. A three-day immersive program, EXPLORE, run through the Office of Admissions, offers an opportunity for prospective students to visit the College, meet students and faculty and experience academic and social life. The program is part of Bowdoin’s strategy for recruiting low-income students and students who would not otherwise be able to visit campus. During EXPLORE, prospective students get to attend classes, have dinner with faculty and staff, meet with financial aid one-on-one and sit for an interview, if they haven’t yet. EXPLORE has a selective admissions process, including submitting a transcript and a personal essay, since all transportation and meal costs are covered by the College. 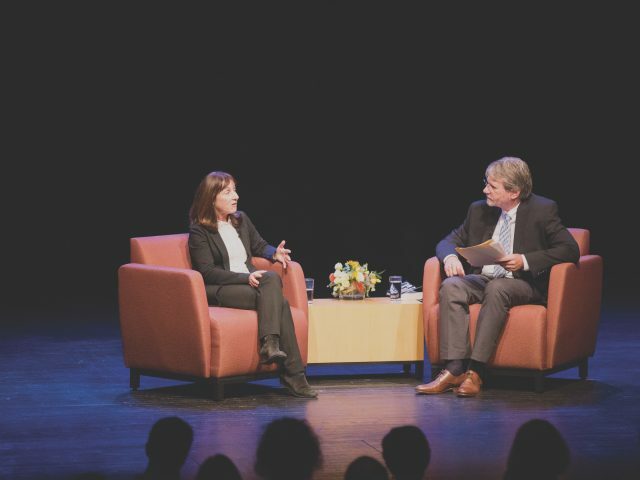 “This is just to parse out who would be an academic fit for Bowdoin, but also the general fit—the personality and character that we think is exemplified in all Bowdoin students,” said Claudia Marroquin, director of the Office of Admissions. The students that EXPLORE targets are typically in lower income brackets, according to Marroquin. Over the 20 years that the program has been running, over half of the prospective students are first generation college students and around 75 percent come from public or charter schools. However, there has been an increasing geographic spread in the students attending EXPLORE, with the largest number of students coming from California. LOOKING AROUND Around 50 prospective students came to Bowdoin last weekend as part of the College’s efforts to recruit low-income students. They met members of the community, attended classes and learned more about academic and social life on campus. Ruby Scanlon, a high school student who attends the Los Angeles Center for Enriched Studies, said the minute she arrived on campus, she attended International Security with Visiting Assistant Professor of Government and Legal Studies Rebecca Gibbons. Scanlon said that the level of participation in classes impressed her the most. 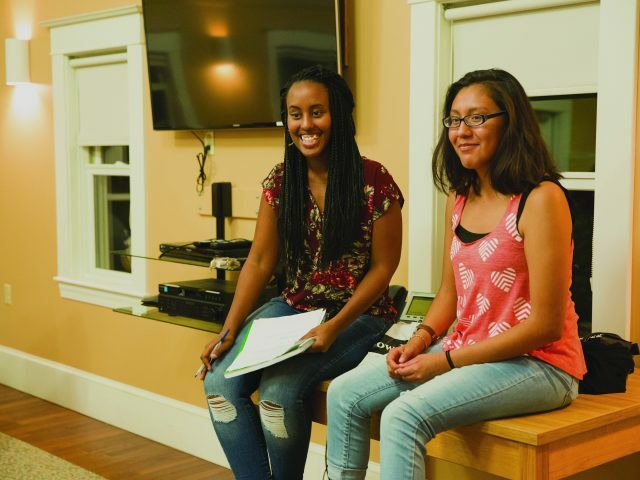 Michelle Veras ’20, who attended the program as a prospective student, said her first introduction to Bowdoin was through living with a host in Brunswick Apartments. “The most significant part was just living there and getting to see what Christina’s day to day life was—she’s a computer science major and works in IT—[and] really being able to see what her life at Bowdoin looked like,” said Veras, referring to her host. 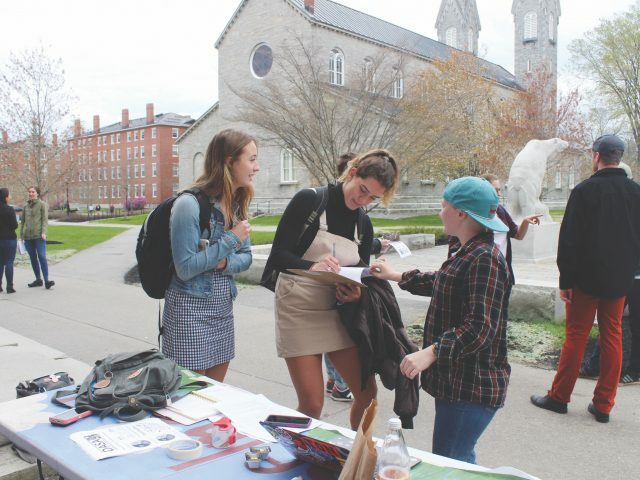 Student groups also planned events—like the African-American Society’s Block Party or Bowdoin Outing Club trips—to give prospective students a sense of what a typical Bowdoin weekend looks like. “We try to make the weekend be a little microcosm of what a semester at Bowdoin might be like,” said Marroquin. Veras attended the Quest for Excellence Group’s meeting for prospective students during EXPLORE and regarded it as influential in her ultimate decision to come to the College. 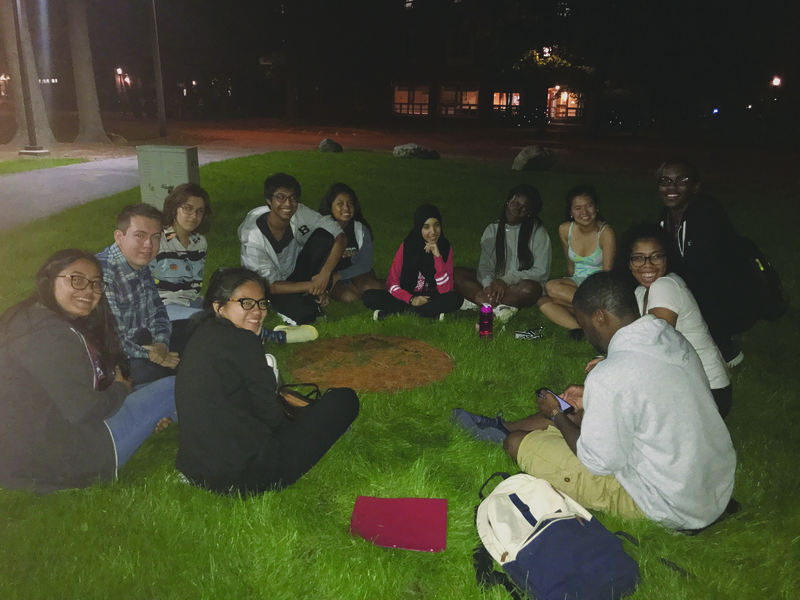 “In that room, I got a sense of how honest the students of the Questbridge cohort were about life at Bowdoin being a student of color, first-gen, minority, low income student. I appreciated their honesty,” said Veras. Scanlon said Burnett House’s Open Mic Night was her favorite activity planned that weekend. The program has historically taken place over the weekend, with arrival day on Thursday and departure early Sunday, to give prospective students a fuller idea of what the College’s social scene looks like. However, the upcoming session, in late October, will take place over a Sunday to Tuesday. “We’re trying to do that and just see how much more of an academic experience they can get by shifting the dates,” said Marroquin. Marroquin did express that there were concerns with shifting the dates, most notably that students would not get a full sense of the campus social scene. However, students will still have the opportunity to do outdoor activities and go to various extracurricular meetings. “Rather than curating an event just for EXPLORE, they are getting to do what current students do,” said Marroquin.